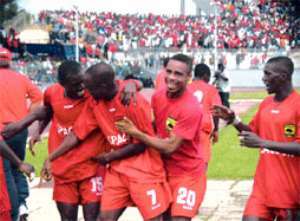 Asante Kotoko are favourites to overcome long-standing rivals Hearts of Oak in the second leg of the African Confederation Cup final on Sunday after a 1-1 away draw in last week's first leg. Hearts' Louis Agyeman equalised with virtually the last kick of the match in Accra last Sunday after Michael Osei had given the Kumasi-based Kotoko the lead just after the hour mark. "We should have scored a second goal to seal the game but I am not disappointed because we are taking an away goal into the second leg," said Kotoko coach Hans-Dieter Schmidt. I'm sure now that we have a big chance to win the Confederation Cup." The tie had been postponed from last month because of presidential elections in the west African country. The Cup is a new competition, combining the old African Cup Winners' Cup and CAF Cup. The final is the first between teams from the same country in a continental club competition.